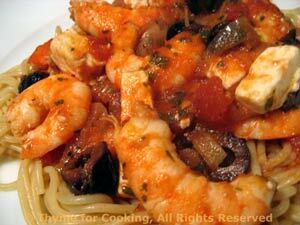 Shrimp with Feta and Greek Olives on Pasta, Thyme for Cooking easy recipes. A simple, 2-course, 2-dish to end the week. Use the leftover tomato sauce for the Stuffed Mushrooms on Saturday. There is just a quick minute or two to cook the shrimp after you have your starter to finish the dinner. These go together quickly and make a lovely presentation when unmolded, especially onto a white plate, with the red tomato sauce. Puréed whole tomatoes have a fresher taste than commercial tomato sauce. Garnish with some olives or a bit of cheese, whatever is on hand. pinch of nutmeg, freshly grated is nice (a pinch is a very small amount; between 1/8th and 1/16th tsp. Thaw spinach - using hot water, microwave, heating on stove top, whatever. When thawed squeeze out all excess moisture (rinse with cool water first if too hot to handle). Put the egg in a medium bowl and beat lightly with a whisk. Add cheese, mustard and nutmeg and stir to combine. 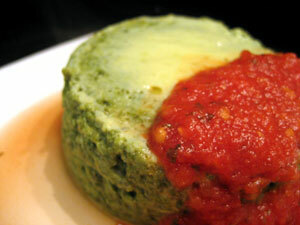 Divide spinach evenly between the 2 ramekins. Bake in 400F (200C) oven for 20 - 25 minutes, until set; top will be firm. Run a knife around edges of timbales and invert onto small plates. Spoon tomato sauce on the side and serve. Purée in blender until smooth. Put into a small saucepan, add basil and heat.